Discover the origins of the creatures known only as the Some Say, the terrifying capabilities of the DeHobo 5000, how a zombie handles the Department for Work and Pensions, and what unwanted punctuation does with its free time. Welcome to In the Frame. Starting in late 2012, halfway through the coalition Government’s term of office, Tom Humberstone’s weekly comic has been bringing a refreshing new form of political cartooning to the New Statesman. 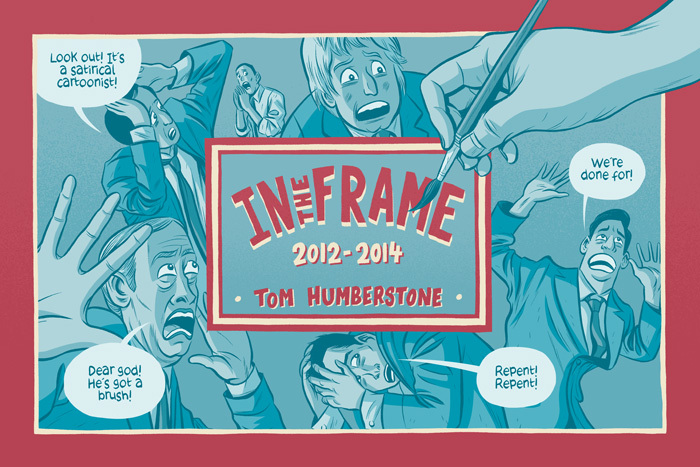 This book collects every In the Frame comic from the past two years in 90 full colour pages. With an introduction by Dan Hancox. In the Frame has been nominated for an award by the Society of Illustrators, and was recently shortlisted in the Best Comic category for the British Comic Awards. The winner will be announced on November 15 2014. “Taken together, these comics provide a gourmet banquet of the scathing cynicism that a glib, dunderheaded 24-hour news culture deserves, with its twitter storms, its dead air, its mythical public, its phoney balance and its factory-farmed politicians – but in spite of everything, Tom never lets snark or sheer exasperation win the day, and reporting from the front line of austerity Britain, the voices of ordinary people fighting cuts to libraries and demanding tax justice sing out from the panels.” – Dan Hancox, from his introduction. “The first thing to say about Tom Humberstone’s collection is that is is really funny, inventive and silly. Add to that his incisive and righteous take on contemporary politics and it becomes an essential primer, a brilliant record of the last two years. Then on top of it all is his sumptuous graphic style. He’s a triple threat. This is a fantastic body of work.” – Josie Long. Pre-order available 10/11/14 from http://solipsisticpop.bigcartel.com/product/in-the-frame-2012-2014. Books will be shipped on 17/11/14. The book will also be available at the Thought Bubble Comic Festival on 14/11/14 for a special convention price of £10.